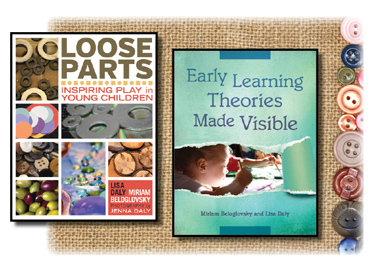 Miriam Beloglovsky and Lisa Daly are the dynamic early childhood education duo behind the 2014 titles Loose Parts and Early Learning Theories Made Visible. For more than 25 years, Lisa and Miriam have been teachers of and advocates for early childhood education. In their first writing partnership together, they debut not one, but two titles in so many months. Loose Parts inspires and informs about the ways loose parts support open-ended learning and enhance play, and Early Learning Theories Made Visible describes early learning theories with engaging stories and rich visuals. Read on to hear more about the creation of these two new books. What inspired you to team up and write Loose Parts and Early Learning Theories Made Visible? As colleagues we frequently travel together to conferences and meetings. During these long car rides we always find ourselves engaged in provocative, reflective, and creative conversations. One of our consistent discussion topics centers on how to help students become thoughtful, purposeful, reflective teachers. Over our years of teaching college we have found that one challenge many students face is making sense of theory, seeing theory in practical application, and making decisions to support young children’s learning based upon theory. On one road trip we coined the phrase “what does it look like?” which refers to how we as faculty can help students see concepts, abilities, and skills that they need in order to be intentional teachers. We started to focus on how we as professors can make key ideas more visible to students. Initially we developed a reflective framework that we used when teaching our observation courses. The concept of a framework expanded in to an understandable text, Early Learning Theories Made Visible designed to help students learn and apply theory. The idea to publish a book on loose parts came out of our mission to preserve childhood and a child’s right to play. We experience a tremendous sense of sadness as we visit child development programs and do not see children at play. As early childhood educators we want practitioners, parents, administrators, and policy makers to know how critical play is in the lives of children. One way we support college students in learning about the value of play, is for them to complete an assignment where they add loose parts to their practicum labs’ classrooms or outdoor yards and then observe how children use the materials in many different ways. To prepare students for the assignment, we show slides of loose parts for inspiration and have students play with open-ended materials. Students become captivated with loose parts. They experience joy in sharing their loose part discoveries and children’s engagement with the materials. The idea occurred to us that it would be exceptionally helpful for anyone working with children to have vivid photos of loose parts and how they are used by children. Such a book would surely inspire play in children. Can you each share a brief timeline of your professional lives? What areas of expertise do you bring to the books? I studied radio, television, and film in college and worked in the industry for many years. I was a weather girl and reporter for a Spanish speaking news station and an executive in charge of production and marketing. After my first child was born, I realized that I enjoyed learning about children’s growth and development. I was fortunate to find a mentor in Carolyn Roberts who encouraged me to get a Masters in Early Childhood Education. The rest is history; I was fortunate to have some of the best leaders in the field as professors. They inspired me to grow and learn. As I was completing my Masters, I started working with young children as a parent educator, and I never looked back. I call this my “growing up years.” After eight years working as a parenting educator and consulting for a variety of children and family programs, I became the director of foster care education at Los Angeles Mission College. In this capacity I had a chance to teach a few child development college courses. When I relocated to Northern California to be near family, I was hired as full time faculty at Cosumnes River College and have been teaching there since. Professionally, I have spent over 35 years in early childhood education as a preschool teacher, director of non-profit programs, and college professor. During graduate school and beyond I was teacher/director of a non-profit preschool called Ross Valley Nursery School in the San Francisco Bay Area and adjunct faculty at San Francisco State University. In 1994 our family relocated to the Sacramento Area. At first I directed a parent cooperative preschool and later accepted the first full-time ECE faculty position at Folsom Lake College where I have been for the past 15 years. I feel as if I am able to draw upon my years of early learning classroom experiences and pedagogical knowledge to transform concepts in understandable ways to college students. My college classes are filled with practical, hands-on experiences to help make learning visible which were an asset in writing both manuscripts. Throughout my early childhood career I have been drawn towards the creative arts. My home garage is full of materials and props for art, storytelling, music, and movement that are used for workshops, in-service trainings, and college classes. You wrote two books together pretty close together. Can you share what that process was like? It was crazy. We often look back and ask ourselves why did we do this and how did we do it? It helped that the two texts were very different. Early Learning Theories aroused our intellectual sides while Loose Parts stimulated our creativity. At times we had to divide and accomplish tasks separately in order to meet deadlines. We relied on each other’s strengths to get the work done. Timelines and organization were very useful as well as our reflective relationship. We trust each other and can have meaningful, powerful conversations. Throughout the writing and photography process we did a lot of self-reflecting and letting go of what was not important. Our favorite phrase was, “Is this a hill to die on?” Sometimes it was, sometimes not. There were times when we experienced what we acknowledged as “sticky points” along the way such as when Miriam was fixated on using Christmas ornaments and Lisa did not see the vision. When we were stuck with how to move forward, we either followed the other’s lead, or we paused and took a step back until new inspiration came. We gave ourselves permission to test new things, make mistakes, and know that it was safe to do so. We always feel safe to challenge each other’s thinking and value feedback. Were there any challenges or surprises that came with writing them? Maintaining our professional and personal lives while writing two books was very challenging. During the writing process we experienced family losses, celebrations, engagements, health issues, and professional challenges. Our schedules as college professors are demanding so finding focused time to work on the manuscripts was difficult. We discovered that we have very different writing and time management styles. It took us time to figure this out and value each other’s process. Working with Redleaf Press has been a pleasant surprise. The level of support and friendliness that we have received from everyone at Redleaf has been really delightful. We did not anticipate the amount of editing that was required and we were surprised by the various types of edits during the writing journey. However, we received tremendous support along the way and the manuscript became stronger after each edit. One challenge with this text was the children’s stories. We captured a lot of children’s learning stories but we did not want to push or force any of the stories to make connections to theory. We struggled at times to find a story that was a good fit to illustrate a theory while honoring the children’s work. To our amazement this manuscript morphed multiple times from our original concept. We learned to give ourselves permission to go different directions and to have flexibility. We were surprised with the enormous number of photos we took. It was a challenge to organize, narrow down, and select the right photos. One fun surprise was how magnetic loose parts were and how they were a shared experience. Everyone we talked to during our loose parts gathering expeditions and photo shoots had a story to tell concerning their own childhood and loose parts. As we engaged in dialogue about loose parts with others there was an instant common connection. We were unprepared for the enthusiasm of students, colleagues, friends, and family members who brought us found materials or shared stories of loose parts in action. We delighted in hearing the profound influence loose parts had in their lives. Another surprise was the number of friends who are grandparents that wanted to buy the book for their own children. It opened up a whole new market that we had not thought about. How will these books help early childhood educators? What do you hope readers take away from the books? We hope that these books will help early childhood educators learn to preserve childhood and value play as a vehicle to learning. The ECE field is exciting and we want teachers to find their voice and passion as they promote developmentally appropriate learning through play. Our desire is for early childhood educators to realize that ECE is based upon a solid theoretical foundation that can be used to discover children’s intent and then to respond in ways that value relationships and support children’s learning. 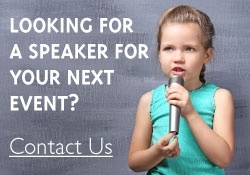 The goal is to move beyond simple recognition of developmental skills such as “this experience enhances large motor development” to deep understanding of whom children are in their thinking, intent, and actions. We marvel and enjoy watching children grow in such profound ways and want others to share our passion. We hope that readers begin to look at materials differently and select items for their programs that have multiple play possibilities. The take away is that ideas are endless and it is important to rely on your own creativity rather than a scripted recipe book. We want readers to experience the joy we have when we walk into a warehouse, hardware store, or garage sale and discover new loose parts. There is a feeling of exhilaration as we ponder upon how children will use the materials. Our desire is that the vivid photographs will inspire readers to transform learning environments and set up provocations with new finds that are aesthetically appealing and stimulating. What do you know now that you wish you’d known when you began your career? We wish that we had known that it’s okay to not know all the answers, been more flexible, and given ourselves permission to make mistakes. We regret not taking time to reflect with people who had more experience and wisdom and not accepting more guidance from them. Teaching is a journey that gets richer and deeper with experience and mentors are invaluable in this journey. We also wish that we had known and understood a child’s need for belonging and significance and how to create a sense of community in the classroom. Our initial training focused on development and curriculum rather than on creating community. Where can we find you both on a typical day? There is no typical day which is why our jobs are so intriguing. On most week days (and many weekends) you will find us prepping and teaching classes; counseling students; attending department, division, college-wide and community meetings; conducting field observations; revising curriculum and assessing courses; and grading papers. Lisa’s morning begins with exercise at Curves and then an hour walk to the lake with her dog Anel and friend Kathie. Miriam’s day often begins with yoga and a walk with her dog Izzy. We can both be found doing something creative in between all the grading. Miriam takes breaks to needle felt or make jewelry. Lisa can be found making greeting cards or baking. Over the years we have been blessed with great mentors whose contributions to early childhood are immeasurable and who helped sustain our love and passion for teaching throughout our careers. Our desire is to continue this legacy by promoting meaningful, intentional experiences to transform teaching. I want to make it to Reggio Emilia; visit schools in Finland; cruise to Alaska; publish more books; do more speaking to spread the word; and travel to look at programs around the world. My hope is to at one point, combine my television/film experience with my ECE knowledge. I, too, want to do more traveling around the world. I want to pursue my passion of doing more mission work with young children and families. I want to learn to speak French and Spanish fluently, write more, tour all of the national parks in the United States, and hike the John Muir trail. Are there any fun facts about yourselves that you’d like to share? Hidden talents? Special interests? I was born and raised in Mexico and came to this country when I was 21. In my spare time I make jewelry and have taken many metalsmith classes. I enjoy working with the torch and manipulating metal to create fun designs. I also enjoy needle felting and hope to give my animal creations to hospitalized children. I was born in Honolulu and grew up in Colorado. I danced the hula with a dance troop from elementary school through high school. My creative side is also seen in the development and implementation of large scale art camps. Each summer I coordinate art for over 3,000 children who attend the vacation bible camp at our church. I love making felt board stories and chocolate chip cookies. 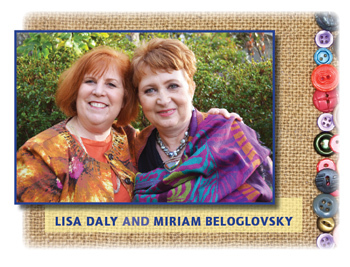 Learn more and see a full list of titles by Miriam Beloglovsky and Lisa Daly.